It is 1814 and London is stricken with madness. Covent Garden by day is a bright place for shopping, promenading and theatre but at night its streets are turned over to the dark trade of prostitution, transforming the Garden into an asylum without roof or walls. Behind closed doors, in their decadently decorated chambers, rich men are murdered, cluelessly, with the utmost savagery, while another society man’s country house is besieged by witchcraft, its servants frightened, its womenfolk ill and troubled. But the mind of Constable Charles Horton, tasked with solving these inexplicable mysteries, is focused elsewhere. Horton’s wife Abigail has committed herself to a madhouse in a desperate attempt to escape the apparition of a native princess who pursues her through the streets of London. Abigail is not the only wife to have separated herself from her husband. Magistrate Aaron Graham’s wife has removed herself from their marriage and has taken her daughter to live with her presumed lover in Thorpe Lee House, a state of affairs that has upset the house and is now worsened by the rumours of hauntings, inexplicable events and night-time noises. Graham despatches Horton to investigate while he himself, until Horton’s return, has to deal with the London murders, the victims each wearing a satyr’s mask. Meanwhile, Abigail becomes fascinated by the straitjacketed girl in the asylum cell next to her own. She can hear her conversations at night although her door is always locked. And all the time, through the night hours, the men in the asylum howl and cry. Savage Magic is a self-contained novel, rich and fertile, but it continues the themes of The English Monster and The Poisoned Island and shares the dark and disturbed and, often, exotic atmosphere of those two excellent novels. In these Georgian years, the British Empire is reaching its most glorious years but that glory is underpinned, fed, by slavery and exploitation. Heavy ships import more than wealth from distant climates, the holds emptied of human merchandise are filled with more than luxurious goods and spices. Savage Magic shows us that this degradation of humanity also takes place on the empire’s capital’s streets – the trade of women as prostitutes. The themes of Savage Magic are dark and the atmosphere is at times intoxicating as the narrative moves fluidly across London’s streets and out into the countryside, following the spread of evil from the nation’s heart. Evil here is fed by the supernatural and not even science is safe. Abigail’s experiences in the asylum arguably form the heart of the novel as she deals with her own demons while also coping with the ministrations of her doctor, whose journal entries, written some time after the events, comprise sections of the book. 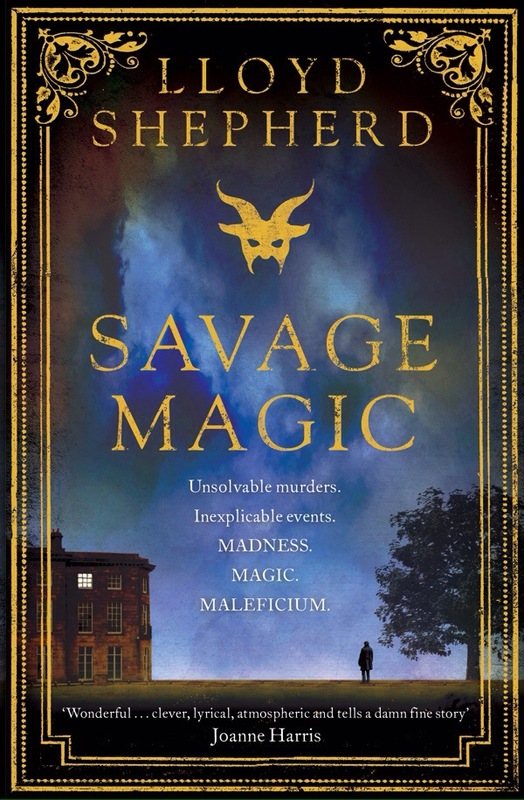 Each of Lloyd Shepherd’s novels is clever but I particularly enjoyed the structure and movement of Savage Magic. While Horton and Graham are frequently caught in circles of confusion, the different strands of the story, moving through time, bringing in other mysterious tales and memories, gently work themselves together. The result is a powerful and shocking conclusion. Reading Savage Magic, and Lloyd Shepherd’s other novels, is an engrossing experience. I can’t think of another writer who can immerse the reader so fully in atmosphere, mixing horror so well with historical fiction. While this can be dark and frightening, often disturbing, it is immensely rewarding and encourages the reader to re-examine history with fresh and open eyes. This entry was posted in Historical Fiction, Horror, Review and tagged Historical fiction, Horror on August 25, 2014 by Kate (For Winter Nights).